Call 402-554-1925 to book by phone during normal business hours. Or book it online anytime 24/7. All group packages require a minimum of 8 paid guests. Outside food and drink are not allowed. Add 7% for NE sales tax. Prices subject to change without notice. Tell the Boss it's time for a break from the norm! The Family Fun Center XL has been the TOP CHOICE of group parties for over 30 years because of the diversity of our attractions. We offer 3 Level Secret Agent Lazertag, blacklight Glow Golf Heroes mini-golf, Soccer Mini-Golf, Lazer Maze, Foot Pool, Rockwall, Billiards and of course a great arcade with video games, ticket games and prize games. We are the best place for this year's office party that goes beyond the norm. Call to book your December 2016 holiday party PRIOR TO NOVEMBER 30th and save huge with the boss and referring employee being FREE! That's over $40 in savings! (after tax) No cash value. Not valid with other offers. Offer expires 11/30/16. Call 402-554-1925 to reserve your event! We can even customize a special package to meet your unique needs and budget. 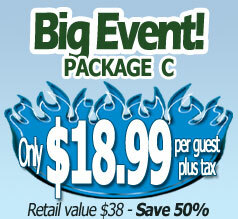 Here we feature our "Custom Party Package" options. You can pick and choose any items to make your event match exactly what you are wanting for fun and needing for your budget. The custom party packages must be reserved by phone, so give us a call us today if you would like to get one of those reserved and we will be happy to answer any of your questions. We can be reached during our normal group hours 7 days a week at 402-554-1925. Custom Parties cannot be booked online. Please call 402-554-1925 to reserve one now.